Check out these cute eggs in my Etsy store. https://www.etsy.com/shop/terpcreek These are all hand tatted butterflies that are attached to paper mache eggs. They are coated with Crystal Glaze. Very cute addition to any Easter basket! 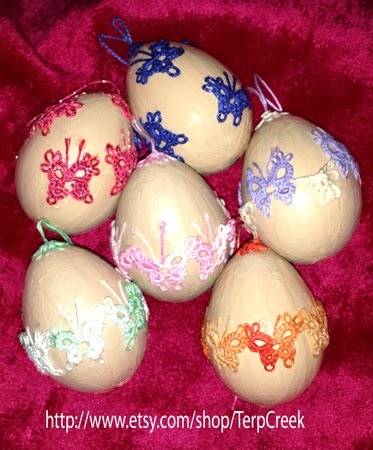 The eggs are paper mache so you do not have to worry about them breaking. Order now while supplies last! They come in three different styles. You may request different colors. The ones you see here are finished and ready to mail. Happy Easter to everyone! 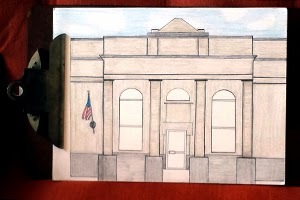 The bank drawing is coming along really good. The man from Detroit might be here next weekend to see it. This is the second drawing of nine. Each drawing is 20 inches by 16 inches. They are done with color pencil as requested by the client. 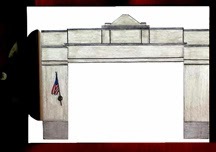 The finished project will have a display case built around the nine drawings. He is planning to have a sidewalk and road in front of all the buildings and precision cars parked on the road. I can hardly wait to see the display! It has been a very cold snowy winter here in Illinois. Lots of wooden barn quilts and drawing orders are being filled at TerpCreek.com. This drawing in going to Detroit Michigan to be put on a car display. More detail later.